Pizza World, May 2011. Binge 2011 stop 2. The littlest pizza eater and I had worked up an appetite by visiting the St Louis Zoo and some of the local pawn shops (they are a little gritty compared to the TV pawn shops), so we decided to eat at Pizza World in Maplewood. We ordered a Garden Salad with house dressing, when we should have ordered a Side Salad. It was bigger than the two of us could eat. It was good, would have been right for 4 people. The littlest pizza eater got a small cheese pizza, she wasn't to keen on sharing so it must have been pretty good. I (The Chief) ordered a medium with Pepperoni, Italian Meatballs, Ham and onions. It was excellent, go to love those meatballs. Labels: 2011, binge 2011, maplewood, Missouri, mo, pizza world, recommended. Bellacino's Pizza & Grinders, May 2011. Binge Stop 1. The Binge 2011 has officially begun...er.. actually it began 3 weeks ago, but I'm just now getting caught up on all my blogging. 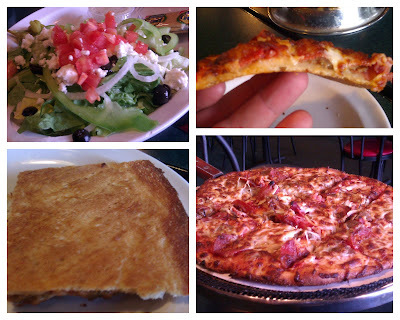 Bellacino's Pizza & Grinders in St Charles was the chosen as the first stop on a whim. We were hungry and it was across the parking lot from The Bass Pro shop, where we were checking out outdoorsy things. We started with a small Greek salad and for pizza we had pepperoni, meatballs, ham and onions. The pizza I was told is first cooked in a pan then finished off on the oven floor. The crust is of the thin variety, yet not as thin as a St Louis style, and is cut on the square. The pizza was great. Bellacino's is what I would call a regional chain with most locations in the mid-West and mid-Atlantic states. If your interested check their web-site (title link) for a location. The Skinny: Ask for Mozzarella and don't forget the Tapas! 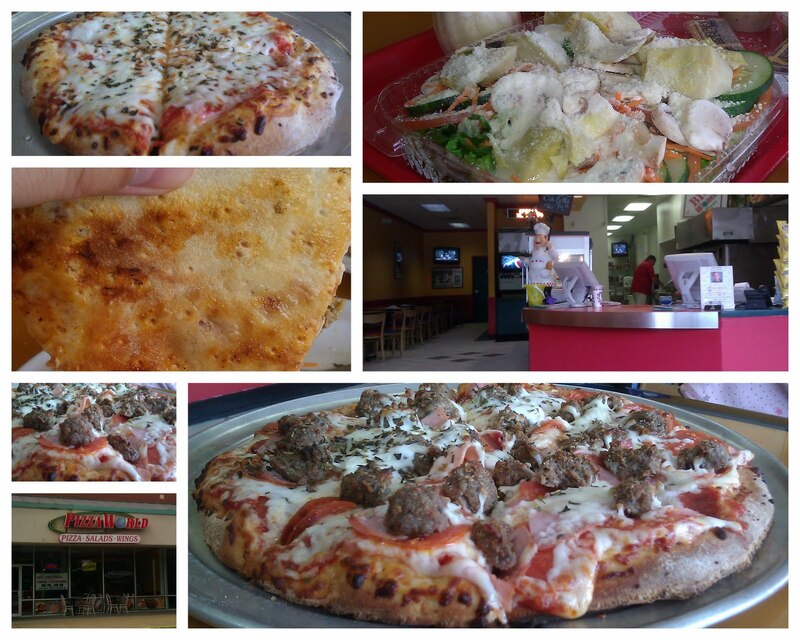 Price: $7.50 small (9in) cheese to $20.95 family (16in) speciality pizza. We set out on Mothers day with a car load of mothers to get pizza, and nearly went hungry. 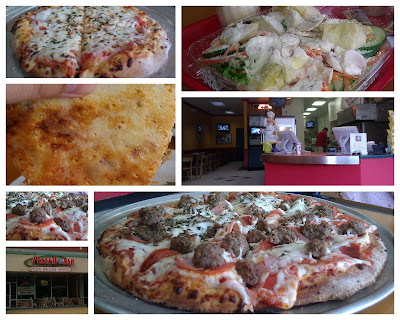 We went to joint after joint finding them all closed, that is until we thought of Guido's Pizzeria & Tapas on The Hill (St Louis's Italian neighborhood). It turns out that a large number of restaurants are closed on Sunday's in the City of St Louis and The Hill is closed down tight with one exception, Guido's. As they say "All's well that end's well". Lesson: if you aren't 100% sure, call ahead to find out the hours of operation. Being the only place open on The Hill seating was scarce, so we chose to dine al fresco, which was perfect as it was a beautiful day. Because not all of the pizza eaters are as dedicated as the Chief, we had quite the mix of food. Things we had other than pizza included: House Salad, Caprese Salad and Ensalad Mixta. from the Tapas menu we had Gazpacho Madrileno, Croquetas Caseras (chicken), and Empanadillas (tuna). By now you must realize Guido's is bilingual, a little Italian and a little Spanish. 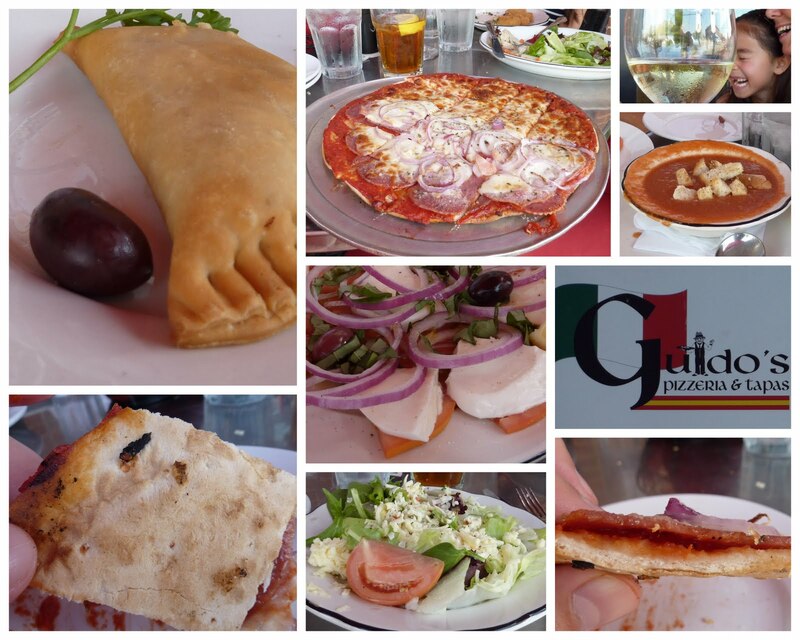 For pizza Guido's offers traditional St. Louis style pizza, with the option to have mozzarella cheese instead of provel. We had a large with half cheese (for the youngest pizza eater) and half with pepperoni, salami, Canadian bacon and red onions. We also chose mozzarella over the provel. The pizza crust was very thin, crispy and cut on the square as one should expect from a St Louis style pie. The pizza was very good, if not a little messy. The inner squares are the messiest as the cheese has no anchor and tends to slide around. My choice of toppings wasn't the greatest, no problems on Guido's part, just my combination. I like salami on pizza's but it doesn't work great with Canadian bacon in my book, next time I will pair it with something a little less salty. Over all the food was very good, and worth a visit. And if it's Sunday Guido's is your only option on The Hill. Recommended any day of the week. The Cheesecake Factory, March 2011. The Skinny: Save room for Dessert! Price: $10.95 for Cheese to $12.95 for The Everything Pizza. I don't always choose the places that I eat pizza at, some times life just toss's me a slice. The Cheesecake Factory is not the first place that comes to mind when you want pizza. Because members of my family like it, I end up there a couple of times a year, and although the food has been good I dread going. It has always been a daunting task for me to figure out what I want. Not sure if you have every seen their menu, but it looks like the New York City phone book. On this visit the Menu was something like 15-20 pages, and the print is quite small! The Cheesecake Factory just list 10 different specialty pizza's in their menu and don't really have a build your own topping list. I guess you could ask to have one made just the way you like, but not sure what the out come would be, I may try on a future visit. I usually like to start with a salad, but knowing the portions The Cheesecake Factory servers and wanting to save room for dessert I passed on the green stuff. For pizza I ordered the B.B.Q Chicken pizza. It had Smoked Gouda, Red Onion and Cilantro along with the B.B.Q. Chicken. The BBQ sauce taking the place of pizza sauce. All that goodness was atop what appeared to be a hand tossed crust of about 12-13 inches. The crust was done up crispy on the bottom and edge. There wasn't to much sauce or cilantro (little goes a long way in my book), If anything it could have used a few more onions, but then again I love those red onions. Had I not been saving room for dessert I would have probably ate the whole pizza even thought 1/2 or 3/4 would have been enough to satisfy my hunger. Finally it was time for dessert and it just happens that Cheesecake is one of my favorites. 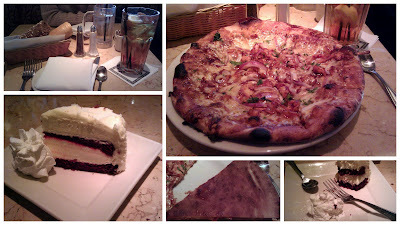 My fellow (non)pizza eater and I shared a slice of Ultimate Red Velvet Cake Cheesecake. If your a sweet tooth and this doesn't make your mouth water I don't know what will. Layers of Red Velvet Cake and Cheesecake covered in Cream Cheese frosting finished with White Chocolate... It was excellent, but I probably should have saved a little bit more room for it. Overall the pizza was pretty good and I would get it again if I'm there with family. I wouldn't pass a regular pizza joint just to eat pizza at The Cheesecake Factory, So Recommended But, only if I'm there at the request of others. Just don't forget to save room for the Cheesecake! It would appear that the Chief has been absent, or more likely absentminded lately. Over the next few days I will get my self busy and finish up several post that have been in the wings since early May. Then the Binge 2011 will begin. I know I said it last year but I really mean it this year. The Binge will be smaller this time. I will do my best to have at least one new post a week for the next 10 weeks, really!